Western blot analysis of extracts from various cell lines using DeltaN p63 (E6Q3O) Rabbit mAb (upper) or β-Actin (D6A8) Rabbit mAb #8457 (lower). Confocal immunofluorescent analysis of ME-180 cells (left, positive) and MCF7 cells (right, negative) using DeltaN p63 (E6Q3O) Rabbit mAb (green). Actin filaments were labeled with DyLight™ 554 Phalloidin #13054 (red). 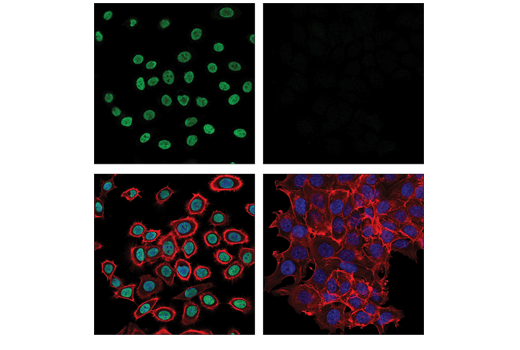 Cells were mounted in ProLong® Gold Antifade Reagent with DAPI #8961 (blue). Chromatin immunoprecipitations were performed with cross-linked chromatin from HaCaT cells and either DeltaN p63 (E6Q3O) Rabbit mAb #67825 or Normal Rabbit IgG #2729 using SimpleChIP® Plus Enzymatic Chromatin IP Kit (Magnetic Beads) #9005. The enriched DNA was quantified by real-time PCR using SimpleChIP® Human CDKN1A Promoter Primers #6449, SimpleChIP® Human MDM2 Intron 2 Primers #90678, and SimpleChIP® Human α Satellite Repeat Primers #4486. The amount of immunoprecipitated DNA in each sample is represented as signal relative to the total amount of input chromatin, which is equivalent to one. 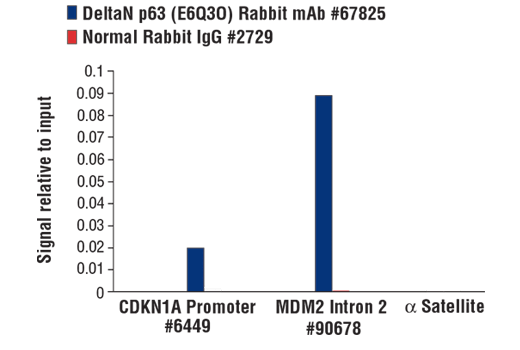 DeltaN p63 (E6Q3O) Rabbit mAb recognizes endogenous levels of total DeltaN p63-alpha protein. 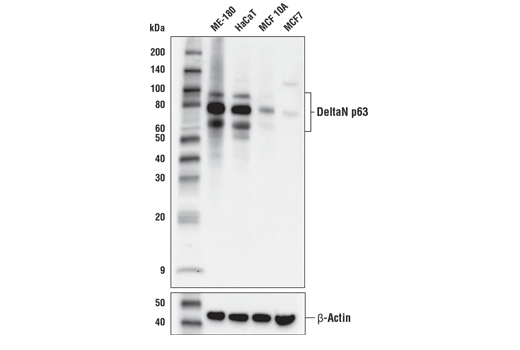 This antibody is expected to recognize all DeltaN p63 isoforms. This antibody does not detect full length (TA) p63. Monoclonal antibody is produced by immunizing animals with a synthetic peptide corresponding to residues surrounding Ala8 of human DeltaN p63 protein. The p53 tumor suppressor protein plays a major role in cellular response to DNA damage and other genomic aberrations. Activation of p53 can lead to either cell cycle arrest and DNA repair or apoptosis (1). In addition to p53, mammalian cells contain two p53 family members, p63 and p73, which are similar to p53 in both structure and function (2). While p63 can induce p53-responsive genes and apoptosis, mutation of p63 rarely results in tumors (2). Research investigators frequently observe amplification of the p63 gene in squamous cell carcinomas of the lung, head and neck (2,3). The p63 gene contains an alternative transcription initiation site that yields a truncated ΔNp63 lacking the transactivation domain, and alternative splicing at the carboxy-terminus yields the α, β, and γ isoforms (3,4). Waltermann, A. et al. (2003) Oncogene 22, 5686-93. Hibi, K. et al. (2000) Proc Natl Acad Sci U S A 97, 5462-7. Yang, A. et al. (1999) Nature 398, 714-8.